A caliper is a tool that is used to measure the distance between two opposite sides of an object, be it the diameter, length, height, etc., then gives the measurement on a ruled scale. It is well-known for its accuracy because jaws are used to get to the object being measured. Digital calipers are a big improvement to the traditional ones, featuring a digital display that outputs the measurement very accurately and makes it easier to read. 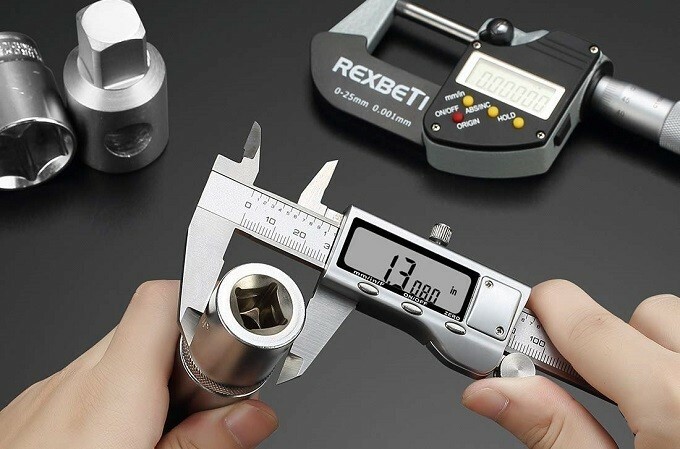 Therefore, for precision measurement, a digital caliper is the way to go and because of this, we cover the best digital calipers in the market that you should consider buying. 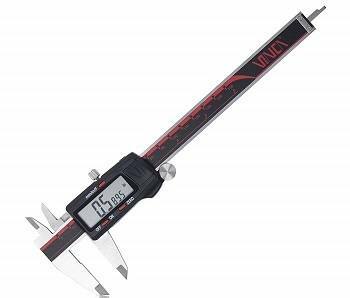 This product stands out as the best Vernier digital caliper because it is quite reasonably priced, yet has a high accuracy of +/- 0.001 inch and provides 3 measuring modes in fraction inches, decimal inches and decimal millimeters, which are interchangeable at the push of a button. In these modes, the unit displays in a resolution of 1/128 inch, 0.0005 inch, and 0.01 mm respectively on a relatively large 0.5 x 1.5-inch LCD display. Stainless steel is used in the construction of this piece and it has a polished finish that looks good and provides better performance due to the smooth gliding in the depthometer’s groove. Other features include 0 to 4, 6, 8, 12 and 24 measuring range options that are fully calibrated before shipping, a data transfer USB port for PC connection, inside and outside jaws, and 2 batteries, in which one is included as a spare accessory. If you are looking to get the most out of your digital caliper purchase, then you should consider this product from MeasuGator because it comes with a 9-blade tester feeler gauge, 3 extra batteries, and a screwdriver, with all being safely tucked inside a protective hard case. 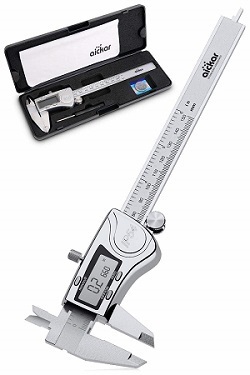 The caliper itself is also part of the kit and it has a sturdy hardened stainless-steel construction with an extra-large high contrast LCD screen for displaying the results. Two measuring modes are built in for showing the length in inches or millimeters, and a well-labeled button placed above the screen is used to switch in between the two. These modes have a resolution of 0.0005 inch and 0.01mm respectively. More features include its whisper quiet sliding action, an anti-slip thumb grip, a locking screw and inside and outside jaws as well as a depth gauge for measuring the depth, differential, step, internal and external measurements. 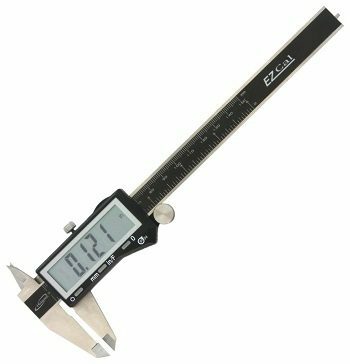 For an accurate caliper, EAGems’ digital unit takes top spot because it gives readings to within +/- 0.0005 inch. 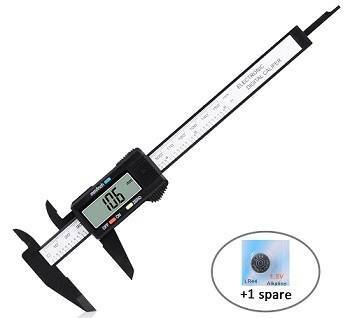 This makes it ideal for taking measurements that must be extremely precise, then displays them either in inches, mm or fractions. Coupled with a resolution of 0.0005 inch, 0.01 mm and 1/64 inch respectively, the result is high accuracy on a large and easy to read LCD screen. To make it even better, this caliper is rated IP54, which means that it has a good level of water and dust resistance and therefore, you should be worried about these elements making contact with the unit. It also has a stainless-steel construction for strength and durability. A set screw is built-in for locking the slider or adjusting its movement while inside and outside jaws as well as a depth bar take the actual measurements. Though expensive, this 500-196-30 is the top-rated digital caliper in this review because of a number of reasons. First, it is produced by a well-known brand in the measuring instruments segment, which is Mitutoyo. The caliper is also very durable due to its water, dust, and oil resistant construction. Basically, it has an Advanced Onsite Sensor (AOS) electromagnetic inductive sensor that resists these elements, ensuring that the electrical components function uninterrupted. Other than this, a stainless-steel construction gives the unit the structural strength required for resisting rough handling and minor collisions, making it very durable. A large digital readout LCD screen is used to display the results from 0 to 6 inches or 0 to 150 mm with 0.0005 inch or 0.01 mm increments. This is after the inside jaws, outside jaws or depth gauge measure the actual depth, step, inside or outside measurements. 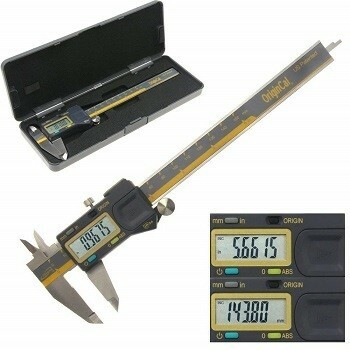 Adoric’s digital caliper is the most affordable product in this review and it still has the 0.6-inch range as the rest, a large and easy to read LCD screen, inner and outer jaws for taking inside and outside diameter measurements and a depth probe for depth measurement. However, the unit is a bit less accurate than the others, giving you measurements that are perfect to 0.01 inch (0.2 mm). It also has a lower resolution of 0.01 inch (0.1 mm), which means it can go as far as 2 decimal points on the inch scale and 1 decimal place in the mm scale. A zero-setting function is built-in to let you begin new measurements at any point in the scale for differential measurements while an auto shutdown function automatically powers off the caliper after 5 minutes without operation for battery conservation. With an IP54 rating, iGaging’s Absolute digital caliper is quite safe to use around water sprays and dust because it is designed to keep these elements from penetrating through to the electrical components inside. The product also has a high accuracy of ±0.001 inch or ±0.02mm, giving its output on a resolution of 0.0005 when using the inch scale and 0.01 on the mm scale. Switching between these two is done simply at the press of a button for easy use. Once readings are taken, they can be transferred to a PC through the caliper’s USB port, though the connecting USB cable must be bought separately. Other features include a strong and durable stainless steel construction with a high-quality surface finish for smooth slider movement and 2 batteries as accessories, one being the spare. 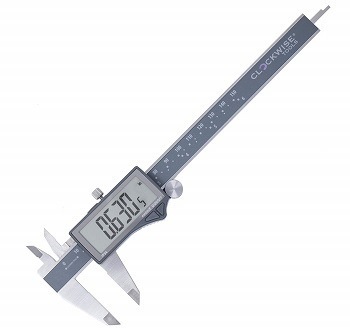 Clockwise Tools’ electronic caliper is very well featured for its price. It has a water and dust resistant body that is IP54 rated for durability by protecting the electrical components inside from these elements. This durability is enhanced by a polished stainless-steel construction that is very sturdy and improves performance by allowing smooth movement along the depthometer groove. The unit also has inner and outer jaws as well as a depth probe for taking all round measurements, after which they are displayed on a large LCD screen. These results are also transferrable to a PC through an in-built USB port, and a DTCR-02 Data cable is included in the pack for this purpose. Other features include a locking screw for holding the slider and 3 measuring modes or conversions between inches, metrics, and fractions. 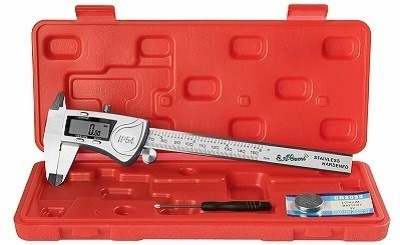 This digital caliper looks good and it performs even better. With its stainless-steel construction, it has a silvery finish that gives it a thumbs up on aesthetics and this also makes the black measurement markings appear very clearly against the shiny background. On performance, the outer layer is smoothly finished to allow for easy sliding as the LCD screen outputs the measurements at ±0.001-inch accuracy. The reading can be converted from inches to mm or fraction inches at the push of a button, making it quite versatile. For measurements, a depth probe, inner and outer jaws are featured, while a zero function, which is activated by the press of a button, is included for resetting the reading at any position, allowing you to take differential readings. Without a battery saving mechanism, most digital calipers arrive with dead or weak batteries due to the continuous power usage by the LCD display. 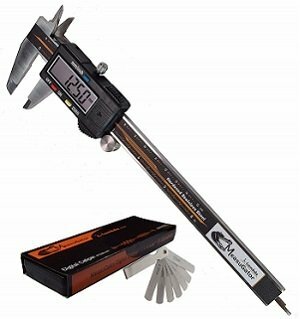 However, with Aickar’s digital caliper, you can be assured of a well-performing battery as you unpack it when new. This is because it has an automatic shut off feature that powers off the screen and everything else that consumes battery power after 5 minutes without any operation. The feature will also help you conserve the battery once you begin to use this product. Other than that, this caliper is graded as IP54, which means that it can resist water sprays and dust from penetrating inside and damaging the electronics, giving it a high durability factor. More features include a zero function for differential measurement and conversion between inches, millimeters, and fractions at the press of a button. A big screen is always a plus because you get larger numbers or results being displayed. iGaging’s unit features a very large 2.38 x 0.88-inch LCD screen that is very easy to read, displaying the results in a resolution of 0.0005 inch, 0.01 mm or 1/128 inch in the respective mode that you choose. Hardened stainless steel is used in the caliper’s construction, and it makes the unit very tough while an IP54 rating ensures that splash water, dust, and oil do not reach the internal electrical components that run the unit. 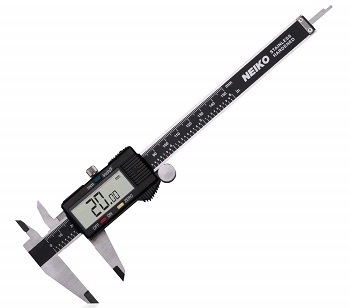 Neiko’s digital caliper has a bit of an edge when it comes to portability because it comes with a compact carrying case that is cushioned on the inside to keep the unit safe as you transport it. With its 0 – 6-inch measuring range, this piece has a large and easy to read LCD screen that displays the measured length in inches, mm or fractions, with a resolution of 0.0005 inch, 0.01mm and 1/128 inch respectively. A depth probe and inner and outer jaws are used to capture the depth, step, inside and outside diameters, while a zero function lets you begin measuring at any point on the slider for capturing differential length. Other features include a machine-grooved thumb-roll mechanism and a locking screw for holding the slider in place. 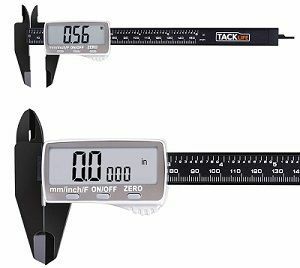 If you are looking for a lightweight digital caliper, then Tacklife’s unit is the best one to consider. This is because it has an ABS plastic construction, which gives it an overall weight of only 4 ounces. On the downside, plastic is quite weak as compared to stainless steel, as it can easily break off. With this though, it comes at a very affordable price and therefore, even if you mishandle it and the worst happens, getting a replacement won’t cost much. This ABS plastic material is also water and dust proof, which means that the internal electrical components will be kept safe from these elements. Other features are inner and outer jaws and a depth bar for measuring external, internal, depth and step measurements, while a zero function lets you reset the reading at any point for recalibration or differential measurement. A zero button is one of the best features in a digital caliper because it makes the process of recalibration much easier and allows you to reset the reading to zero at any point. This resetting allows for some sort of differential measurement, just like in the dial calipers. The result of this is a more versatile unit and therefore, this feature should be highly considered. These are the most essential parts of any digital caliper because they are used to measure the inner and outer dimensions of an object. All calipers have these jaws and it is important to handle them with care (especially the inner jaws) because once they break, your caliper is useless. Apart from the jaws, a depth gauge, also known as a depth probe or bar, is similarly important for measuring thickness and hole depth. A step gauge is also good to have so as to measure the length from an edge to a point on the object. Basically, all these make the digital caliper more versatile because they give more functionality in one. A locking screw is a necessary convenience feature that locks the calipers jaws and slider in place so that the parts do not move or slip as you take the measurements. 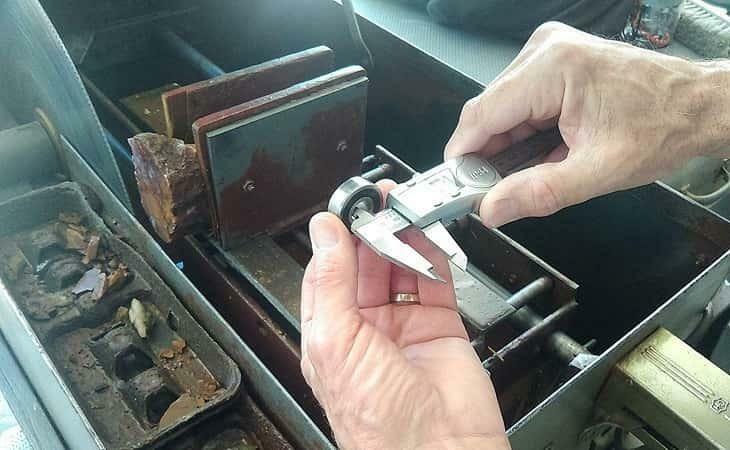 Without it, you might have a difficult time taking accurate measurements because the jaws will move slightly as you take the caliper out of the object, causing the readings to change a bit. Different calipers are equipped with differently-sized LCD screens and the larger it is, the easier it will be to view the displayed readings. Also, for the highest accuracy, ensure that the caliper displays a big number of decimal places in what is otherwise known as the resolution. Basically, the lower the resolution (more decimal places), the better. Smooth jaw movements and highly sensitive machined thumb wheels are just but a few features that make any digital caliper easy to use. Other desirable features that you should look for include a large display (as described above) and clearly marked push buttons for easy operation. Some digital calipers have an IP54 rating, which basically means that they are resistant to dust and water sprays. Even though such units may be more expensive, this is a good feature to have because it raises the durability factor. This product is very easy to use, but if you don’t follow the right steps, then you can get a lot of inaccuracies in the measurement process. To avoid this, use the tips below. Ensure that you start from zero every time. Also, check the calibration before use. Most units come with calibration rods from the manufacturer and you should use this before use to make sure the caliper is well set. Don’t over tighten the caliper. Proper contact is made once you feel a slight resistance if you try to pull the caliper’s contact pads across the object’s surface. Overtightening will slightly compress the object and this may alter its size measurements. Whether you are measuring the outside, inside or depth, position the caliper’s jaws or depth gauge perpendicular to the object. There is quite a lot about digital calipers than what meets the eye. For this reason, it is important to be well informed about the different features that these products have before purchasing one. This article is very resourceful and it explains all these features. 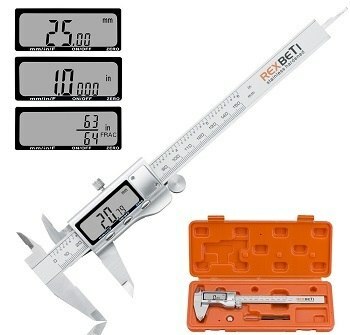 After reading through, you should have a much easier time picking the best digital caliper that suits your needs.